So you’re at a party, and someone says something ignorant . And while you know that they’re in the wrong, and that you could totally engage them and win if you were a bit more prepared, your words escape you. To make sure that doesn’t happen, we’ve compiled a series of handy reference guides with the most common arguments — and your counter-arguments — for all of the hot-button issues of the day. 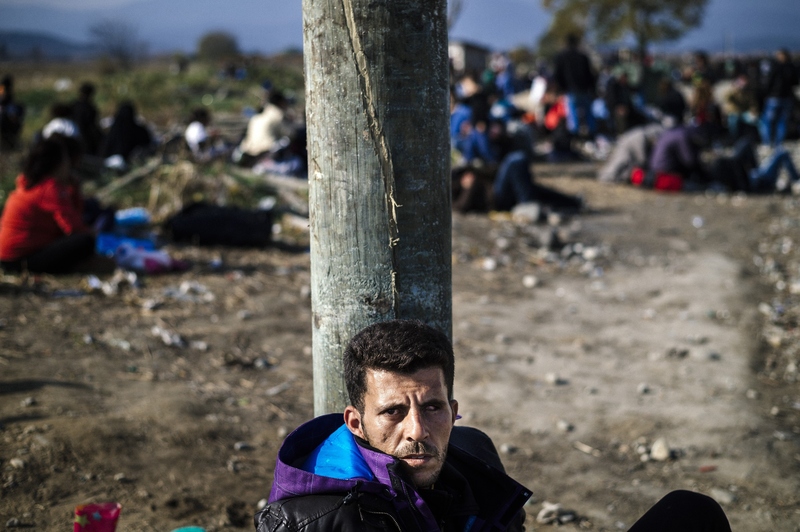 This week’s topic: How to argue for granting Syrian refugees asylum. Argument #1: "It's too dangerous to let them in. What if some ISIS militants sneak through?" Your Response: It's not unfair to be worried about ISIS reaching U.S. soil. It's been vociferous in its threats against an array of western nations, the U.S. included. A successful attack would no doubt be a boon to them, stirring up an even more aggressive American military response, which could galvanize the Islamic world against us. But ISIS militants could sneak through American borders any number of ways. That risk is basically never-ending, so long as we're locked into geopolitical hostilities with high-profile terrorist organizations. Punishing ISIS's own victims for its atrocities — remember, these are people who fled Syria due to the brutal violence that's engulfed the country — is, well, atrocious. Argument #2: "We've already taken in thousands of Syrian refugees. Enough is enough." Your Response: The United States has agreed to take in about 10,000 refugees in 2016, but that's not set in stone — much less so now that (mostly conservative) politicians have been beating their xenophobic drums in the aftermath of the Paris attacks. And even if those 10,000 are still able to get in without a hitch — unless, of course, you consider the two-year screening process prospective refugees must pass to be a "hitch" — that's a truly narrow sliver of the people who've been displaced. According to the United Nations High Commission For Refugees, a total of more than four million Syrians have been left to twist in the wind, to say nothing of the millions more displaced within Syria. And more to the point, it's hard to miss how the rise of ISIS in the Middle East is inextricably linked to American activity in the region — the invasion and destabilization of Iraq first and foremost. If we want to maintain a shred of moral authority in our international dealings and still be so enamored with allegedly righteous foreign invasions, then we have to at least be willing to absorb the human costs in additional to the financial ones. In other words, we owe these people, and it's time to live up to our rose-tinted view of American humanitarianism. Argument #3: "Wouldn't it be safer to just say no? You have to admit that." Your Response: It's actually trivially easy to imagine how apathy toward millions of refugees would make us less safe, not more. If the rise of ISIS out of the tumult of the Iraq war reminds us of anything, it's that American policy has a hugely outsized impact on the world, and can carry massive unintended consequences. Simply put, the abandonment of our moral and international responsibilities at a time like this would breed even more disdain and hostility, both around the world and within that group of refugees. In other words, for all the scary rhetoric politicians use about so-called radical Islamic terrorism, some American politicians (including more than half of the nation's governors) are taking a tack that will surely breed more. Remember, anti-western sentiment is core to ISIS recruitment, and that's easier to stir up when the U.S. allows itself to be baited into these kinds of panicked, reactive actions. Argument #4: "But isn't this exactly what ISIS wants? A way to slip into America unnoticed?" Your Response: Some members of ISIS would without a doubt, like to mount an attack against the U.S. from inside its borders. If nothing else, the Paris attacks showed that no militarized western state is necessarily going to deter them. But if you're asking what ISIS really wanted out of last week's horrifying attacks, here's an easy way to sum it up: virtually everything that's happened since. There have been reports of ISIS leaders dying in recent airstrikes, sure, but that's basically the price of doing business for a terrorist network. More significantly, they've successfully provoked the exact kind of aggressive posturing abroad (and paranoid posturing at home) which drives an even deeper wedge between predominantly Islamic communities and western powers. Outright barring Syrian refugees from America, rather than undertaking the hard work of verifying and checking their backgrounds, would only further serve that outcome. And lest we forget, these refugees are in large part fleeing from ISIS, effectively rejecting the group's claim to represent all Muslims worldwide. ISIS would be thrilled to thwart their victims' asylum-seeking efforts, even if it weren't a great recruitment tool (which it is). Argument #5: "Why not only let in Christian refugees?" Your Response: Somebody's a potential Jeb Bush voter, huh? Why not just say "let's screen people to make sure they don't have connections to militant Islamist groups"? That seems like a specific, fair, and appropriate response, and one ostensibly consistent with our national values. On the other hand, though, we could impose an exclusionary religious litmus test to determine whether we're going to treat desperate refugees like human beings. Once again, however, that sounds suspiciously like something ISIS would love for us to do. The narrative that the United States is engaged in a pointedly religious war with Islam is a powerful one. Argument #6: "I'm not anti-immigrant or anti-refugee. I just think we need a strong, secure border." Your Response: Then you should support those refugees who successfully pass through America's slow-moving, stringent entry process. Which, again, is letting in a very low number relative to the more than four million refugees the UN has identified. Only about 2,000 have actually made it to the U.S. over the last several years, and only 10,000 more are expected over the next twelve months. For a compelling comparison, think about how Republicans have been talking about immigration lately. There are plenty of people on the political right who're vehemently opposed to illegal immigration, but insist they're not anti-immigrant because they support legal immigration. You've heard the type — usually, there's a lot of talk about the nobility of legal immigration, the wrongness of letting undocumented immigrants "cut in line," the boldness of the American spirit, and so forth. If you're one of those people, this is where the rubber meets the road. If someone successfully navigates the extremely unlikely, difficult refugee process, then they've done exactly what they were supposed to. They've filed every form, signed on every line, cleared every hurdle. They are, for all intents and purposes, legal immigrants to this country, albeit for unusually dire reasons. For so many in the Republican Party to crow about supporting legal immigration, all while trying to block thousands of refugees who went through the system, lays bare a lot of cynical dishonesty.